Republican Presidential candidate and Texas Senator Ted Cruz politely disaccords with Donald Trump’s proposal indefinitely ban all foreign muslims from entering the U.S., telling Bloomberg on Tuesday "I disagree with that proposal.” Yet he refused to condemn Trump, and even praised his rival candidate saying "I like Donald Trump.” Cruz has done this before. When Trump proposed a national Muslim registry and other infringements on civil liberties, Cruz rejected the plan, but not the man. "I'm a big fan of Donald Trump's but I'm not a fan of government registries of American citizens," Cruz told reporters in November. "The First Amendment protects religious liberty, I've spent the past several decades defending religious liberty." Ever since Trump announced his candidacy, Cruz has been performing this elegant dance. Cruz moves across the electoral dancefloor hand-in-hand with Trump, somehow keeping up with him while avoiding taking exactly the same steps. Back in June, Trump announced his candidacy in a prepared speech. He declared that most Mexican immigrants were rapists and drug dealers. “When Mexico sends its people, they’re not sending their best. They’re not sending you. They’re not sending you. They’re sending people that have lots of problems and they’re bringing those problems with us. They’re bringing drugs, they’re bringing crime, they’re rapists, and some, I assume, are good people,” Trump said. When NBC broke a business deal with Trump over his rhetoric and his ideas, Cruz stood up for him. "I like Donald Trump. I think he's terrific, I think he's brash, I think he speaks the truth," Cruz said on Fox News. "And I think NBC is engaging in political correctness that is silly and that is wrong." 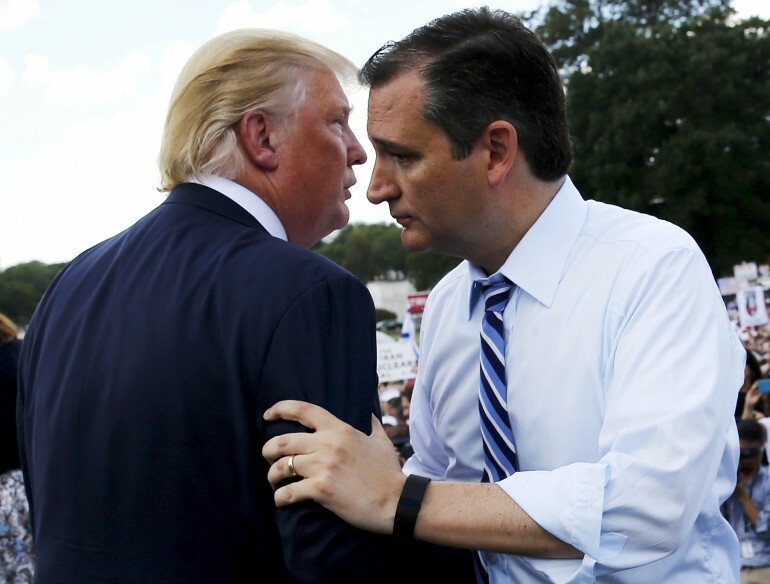 At first, Cruz’s reluctance to condemn Trump came off as polite. But Cruz’s reluctance to commit what he calls “Republican-on-Republican” violence seems more and more questionable as Trump become more venomous, including to his own party. Why, for example, did Cruz stand up for Trump when he insulted Sen. John McCain’s military record as a POW? As the New York Magazine’s Margaret Hartmann points out, Donald Trump’s Muslim ban is actually about Ted Cruz. Trump’s brash politics have created an opening for Cruz, a crack in a door that’s been to centrist to let him have a shot at the Republican nomination, or his policies on immigration and religion from becoming the law of the land. Trump doubled down on his comments about immigrants. He went on to call for deportation of all 11 million immigrants in the country illegally, most of them Mexicans and millions of them parents of children born or at least raised in the U.S. He also proposed preventing children born in the U.S. to immigrants in the country illegally from obtaining birthright citizenship. For once, Ted Cruz didn’t politely disagree with Trump’s controversial idea. Instead, he endorsed it. “We should end grant­ing auto­mat­ic birth­right cit­izen­ship to the chil­dren of those who are here il­leg­ally,” he told the National Journal, though he pointed out that he wouldn’t go as far as Trump, who wanted to strip second-generation immigrant citizenship retroactively. Cruz has also endorsed Trump’s proposal to build a physical border wall along the U.S. Mexico border, and told one radio host that he’d hire Donald Trump to oversee the construction. Unlike Trump, Cruz has demonstrated a solid craspo of foreign policy and constitutional law (he is a former Supreme Court Justice Clerk). For example, Cruz recognizes that immigrant children can't be barred from or stripped of citizenship. Instead he want's to amend the constitution. When Cruz and Trump's positions differ, it's often because the former is thought out and might even be legal, where the latter was a trumped up of a tweet from just hours ago. Cruz is hoping that when Trump inevitably steps off the dancefloor, he’ll be able to scoop up the controversial candidates supporters, an army of fringe that could help push him forward in the primaries. In the meantime, centrist voters might find Cruz stepping on their toes.